One of the most relaxing ways to spend a lazy Saturday afternoon in the United Kingdom is to get yourself and a few chums on board a narrowboat and go for a leisurely traverse along one of the canals in the extensive canal network that cris-crosses the country. And this is exactly what we would have done, had not the vagaries of one company’s booking policy left us suddenly without the booking we thought we’d made at fairly short notice. 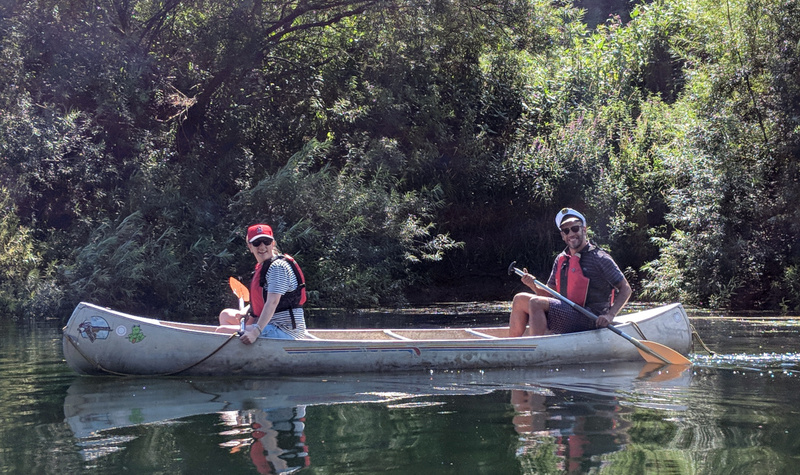 Luckily for our posse of chums, my wife is nothing if not resourceful – and between the pair of us with a flurry of websearching, emailing, and phonecalling we managed to tee up a sort of replacement afternoon activity… CANOEING! 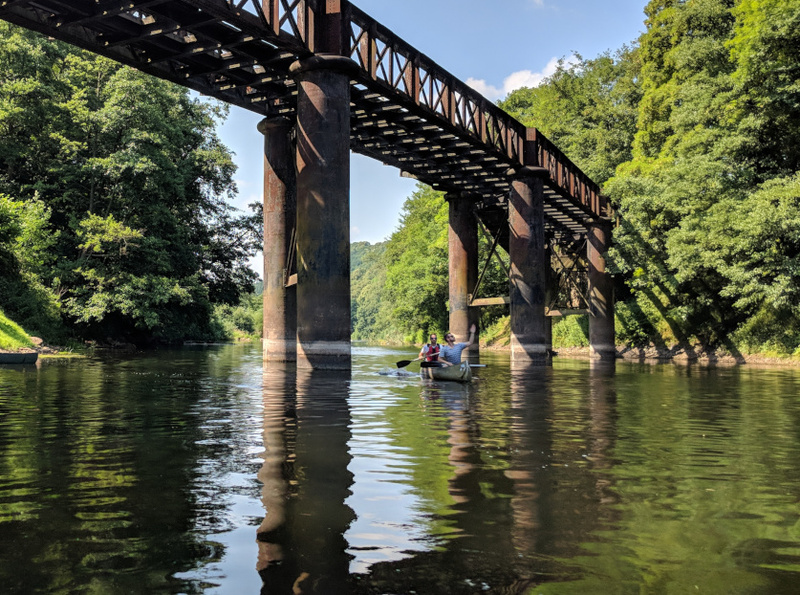 A short-ish drive from Bristol to Monmouth (in our case, via Tewkesbury to drop off The Hound – who would have been no use whatsoever on this mission) and our hosts Monmouth Canoe had us set up in some Canadian Canoes on the gorgeous River Wye. 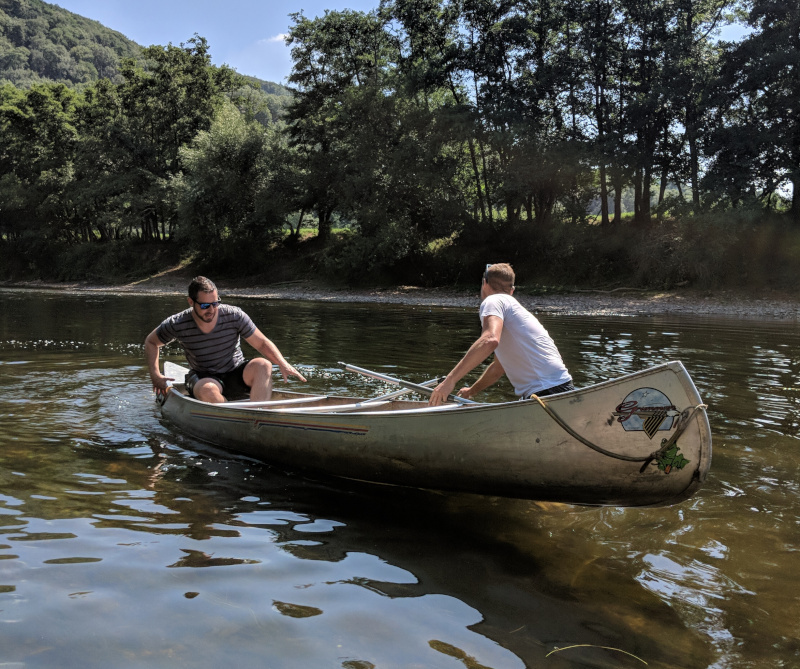 I’ve probably not been in a canoe since around 2001 and so it was a mixture of excitement and trepidation that accompanied me – but once we were out on the water it was, er well, plain sailing. 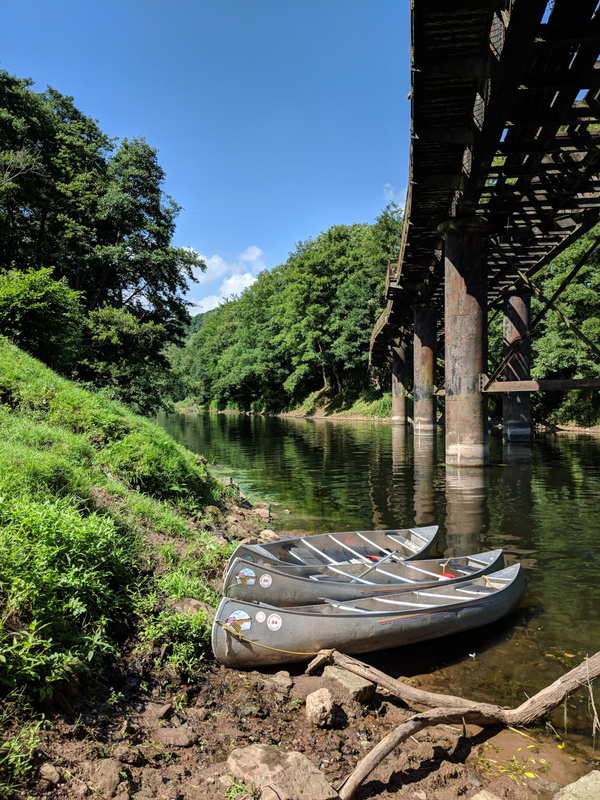 The canoes were a lot more stable than the nimble little kayaks I’d trained in, and so with the spectre of capsizing out of view we could really get on with discovering how unfit we were and how ill-conditioned our upper bodies were for sustained paddling. For the most part the water on this occasion wasn’t much more than ankle-deep and there wasn’t a lot in the way of current – a fact which wasn’t lost on those members of the party who thought buoyancy aids were overkill… Personally in these situations I feel that a sense of fashion-consciousness is somewhat misdirected. The party managed to escape calamity for the most part: Kev & Jase went in at one point, but then when we pulled up for a break on the little beachy thing they jumped in for a swim anyway so getting wet was hardly an imposition. Lisa & Caleb managed a post-pubstop tip in, but again it didn’t seem to affect their performance massively. Adrian got my vote in the fashion stakes – it’s essential in these sorts of circumstances to have the correct headwear. 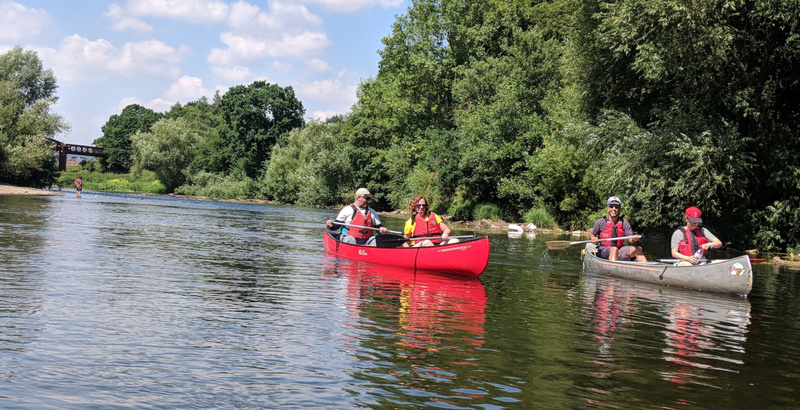 The “expedition” (as I’ll call it) took us from the ramp at Monmouth, along to Redbrook (and a cheeky unit of electrolyte-replacement tonic at The Boat Inn), then back into the canoes and along to the pickup point at Whitebrook. Total trip time was around 4 hours, which was remarkable now I think about it given the guy doing the briefing suggested it was about a 45min-1hr paddle for each section. It’s almost as if he knew we were unfit and predisposed to a bit of fannying about… I managed to get an unexpected zap on the arse from the electric fence at the pickup point – I’d have thought you’d put signs on an electric fence saying “Warning: Electrified Fence”, or similar. It doesn’t seem to have bestowed any further superpowers on me to date; the main outcome being the feeling that my entire spine lengthened by 2mm per vertebrae and then contracted again. Having not done the pre-reading I didn’t realise that we were in effect paddling along the English/Welsh border. Not that it matters, but it’s moderately interesting. Sort of. A lovely convivial & fun afternoon on the water, in beautiful surrounds. And when accompanied by our little gaggle of legends, you’ve really got all the ingredients for perfection. I feel that this sort of thing may make it into the planning rota for future summers. On the car trip home to ours the words “white water” were heard to be uttered… so maybe there’ll be a chance for me to tip us into a river yet! I think it’s important at this juncture to give credit where credit’s due – I didn’t take any of these photos. I was too busy paddling and concentrating on not being responsible for tipping us into the Wye. All photos courtesy (and copyright) of Simon Brock-Lowthian / Lowthian Photography. Next PostQuite the fan of his new ball. #larrybstanding the sports enthusiast.